Prices are created through interactions between sellers and buyers. Supply (sellers) and demand (buyers) is the first, most recognized model in economics. Demand represents the various numbers of items that consumers are willing and able to purchase at a series of different prices at a particular point in time. 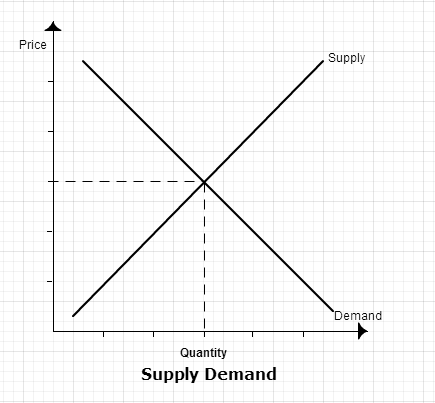 The downward slope of the line illustrates the “Law of Demand”: as prices decrease, the quantity demanded increases and vice versa. You have likely experienced this in your own life. Let’s use school supplies as an example. Imagine that you need pencils. If the price of a pencil is $1, you buy one. 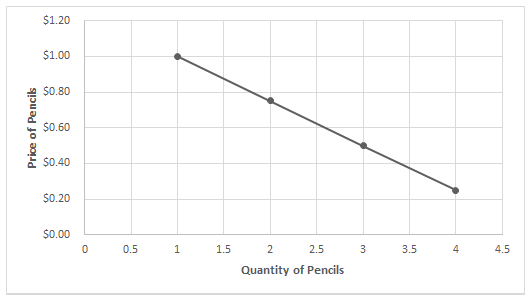 However, you are willing to purchase more pencils if the price is lowered, as shown in the table below. The pattern for supply is the opposite. Supply represents the various numbers of items that producers are willing and able to sell at a series of different prices at a particular point in time. Producers are motivated by profits. Therefore, as the prices drop, they are less and less motivated to produce quantities. The “Law of Supply” states that as the price drops, the quantity supplied also drops. The relationship is direct, creating an upward slope for the supply line. The interaction of supply and demand is what establishes market prices. The prices at the grocery store, sandwich shop, or online music downloading site are established by the forces of supply and demand. The price of a twelve-inch sandwich is $5 because at that price, consumers are willing to buy 500 subs and the business is willing to sell 500 subs. The price settles at $5 not through government policymakers setting prices, but naturally. It is called the equilibrium price and is the most efficient method of allocating resources. The price is not always correct at first. If a business marks an item too expensively, consumers react by not buying the item. A surplus emerges, and shelves become overstocked. How does the store owner react? By lowering the price. The price will spontaneously find its equilibrium. Likewise, the price can be too low. The day after Thanksgiving is referred to as Black Friday and is famous for its low sale prices. Stores advertise products at deeply discounted rates. However, at the low prices, there are generally a limited supplies available. How do excited consumers respond? They line up, sometimes for hours in advance, before the store opens in order to get the deals. The store sells out quickly. A shopper entering the store at 4p.m. on Black Friday finds empty shelves. That condition is called a shortage. When the price is at equilibrium rather than too low, there are appropriate numbers of items available for sale, and shoppers do not have to incur added costs of hours spent in line or searching around at many stores. Conditions that shift the demand line are changes in consumer tastes and preferences, incomes, market size, expectations of future prices, and the prices of related goods. Another demand shifter is a change in consumer incomes. If there is an overall decrease in wages due to a recession, buyers demand fewer normal goods. The line shifts to the left. With this new condition, the equilibrium price and quantity decrease. The other determinants of demand also change equilibrium. If the number of buyers changes, it shifts the entire demand line. More shoppers shift the line right, and fewer shoppers shift it to the left. If consumers expect prices to change, they react by trying to buy items when they have the lowest prices. For example, a drought in much of the U.S. led many to predict that the price of beef would increase. The overall number of cows raised for beef decreased and prices went up dramatically. Expecting the increase in beef prices, many consumers stocked freezers before prices could increase. However, these predictions are not infallible. Incorrect predictions can lead quickly to surpluses and shortages. If, for example, the drought mentioned above did not have the expected impact on the cattle population, a surplus would result causing prices to drop. This is because consumers would have already stocked their freezers with the beef they needed, causing a decrease in demand. Finally, there are two types of related goods that shift the demand line: prices of substitutes and of complements. Many items have substitutes: a red sweatshirt instead of a blue sweater, a pork chop instead of a steak. 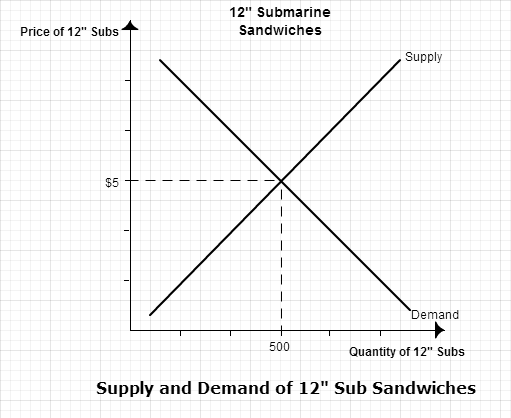 When the price of an item increases, the demand for the substitute increases, and vice versa. A complement is an item that goes with something else: peanut butter goes with jelly, tennis shoes go with socks. According to the law of demand, if the price of one item increases, less of the item will be purchased. And if you don’t buy one item, you don’t need its complement. If the price of peanut butter increases, consumers buy less of it. That causes the demand for jelly to go down and the line shifts leftward. As a result, the price and quantity exchanged of jelly decrease when the price of its complement, peanut butter, increases. The supply line can also shift, creating an entirely new equilibrium price and quantity. Determinants of supply have to do with changes by producers. Conditions that shift the supply line are changes in resource costs, prices of alternate goods, technology, number of suppliers, expectations of future prices, and government policies. If the price of resources needed for production or distribution increase, fewer items can be produced at each price level. The price of oil is an important example. Since many items are made from petroleum, when the price increases for oil, it becomes more expensive to produce. The entire supply line shifts left. The result is an increase in price and a decrease in quantity. On the other hand, new technology reduces the cost of production, causing the supply to increase, decreasing prices and increasing the quantity exchanged. Another determinant is the price of alternate goods. If a producer could either make luggage or purses with the same capital it already has, the company will choose to produce the item which will bring the highest prices. If the price of luggage goes up due to a change in consumer demand, the firm will choose to use its resources making suitcases instead of handbags. In turn, the supply of purses will shift to the left. As a result, the price increases and quantity decreases for the market of purses. The number of suppliers shifts the entire supply line too. If more firms enter the market for restaurants, the supply of restaurants food increases. The increased competition has the effect of lowering prices and increasing the quantity of restaurants meals sold. On the other hand, if several landscaping companies in a region close, the outdoor services become more scarce. Supply shifts to the left, increasing the price and decreasing the quantity of landscaping on the market. Prices may seem objective enough—after all, they appear as specific dollars and cents—but that doesn’t mean they represent the same degree of value to all of us. Prices may seem objective enough—after all, they appear as specific dollars and cents—but that doesn’t mean they represent the same degree of value to all of us. There’s a great deal of subjective (or personal) value in the prices we pay for things. Think of a price as an exchange ratio. It’s the point at which a buyer and seller come together and agree to make a trade. It’s tempting to think that each party must equally value the good, service or money that’s being exchanged but that’s not the case at all. Each party values what he’s getting more than what he’s giving up or the trade wouldn’t happen in the first place. When I buy a newspaper for one dollar, I don’t value the newspaper the same as the dollar. If that were the case, why bother to trade? I actually value the paper more than the dollar. In contrast, the person who sells it to me would rather have the dollar because he values it more than the paper. We’ve all had the experience of buying something at a bargain price. Sure, that was the exchange ratio but we might have wanted that item badly enough that we would have gladly paid twice the price and still thought we got a bargain. So the exchange ratio just tells us the terms of an exchange; it doesn’t tell us any more about value than the fact that both sides to the trade believe they’re better off for having made it. When economists speak of value, they are dealing with something that’s highly subjective, a concept captured by the old phrase, “Value is in the eye of the beholder.” Each of us has our own, ever-changing, impossible-to-quantify, scale of values. You like a blue shirt, I prefer a white one. Maybe we’ll change our minds tomorrow. The one thing for certain is, the more we already have of something, the less we’re likely to value one more unit of it. Economists call that marginal utility, and it’s based on our personal, subjective valuations of goods and services. The first bite of the ice cream provides the greatest satisfaction. Likewise, I may not pay for a bottle of water if I’m already drowning in it but if I’m in a hot desert, I might pay almost any price for one. How we personally assess our situation at any given moment and how much satisfaction we think we’ll get if we make a trade will go a long way to affecting the price at which we’re willing to buy. The same goes for the seller. Bottom line: Don’t think of price as a measure of value because it isn’t. Value is just too personal to be so precisely measured. In a market system, the equilibrium price is only partially dependent on the costs involved in producing an item. Certainly, a business needs to earn enough money to cover all of its expenses. But the actual value of goods and services is more subjective. When a boy trades $150 for a new cell phone that tells us the boy prefers the cell phone over the $150 and that the store prefers to have $150 rather than the cell phone. The fact that overall wealth can be added just through the transfer of property from someone who values it less to someone who values it more proves the economic theory that people gain from voluntary trade. Video: Why Do We Exchange Things?